The government agency accused of “industrial espionage” against Brazil participated in secret meetings where Canadian energy companies were briefed by federal security agencies, The Guardian reported Wednesday. Citing documents obtained under freedom of information laws, the British newspaper said Communications Security Establishment Canada (CSEC) participated in meetings that have been held twice yearly since 2005. Energy companies at these meetings are briefed on such issues as threats to energy infrastructure, “challenges to energy projects from environmental groups,” and “economic and corporate espionage,” The Guardian reported. The meetings themselves had been reported on before, but CSEC's participation appears to be new information. The detail could be significant, as CSEC is tasked with electronic surveillance outside Canada. The Department of National Defence, intelligence agency CSIS and the RCMP are all believed to have attended these meetings as well. 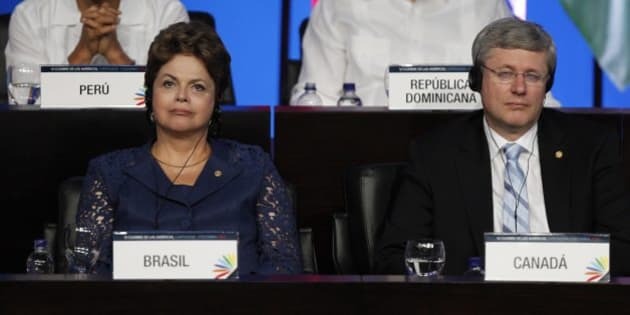 Brazilian President Dilma Rousseff earlier this week demanded an explanation from the Canadian government after Brazil's Globo television network reported that CSEC ran an espionage campaign on the country’s mining and energy ministry. The news report cited documents leaked by Edward Snowden, whose revelations of NSA spying caused an uproar over the summer. The documents obtained by The Guardian provide further evidence that Canada’s federal government has leveraged its intelligence capabilities to help the energy industry and monitor its opponents. The Guardian reports that some aspects of the meetings were financially supported by the energy companies involved. One meeting featured a lunch sponsored by Enbridge. Glenn Greenwald, one of the key journalists involved in the Edward Snowden leaks of NSA data, told Canadian media this week there are many more revelations coming about Canadian spying from the leaked NSA documents. "There's a lot of other documents about Canadians spying on ordinary citizens, on allied governments, on the world, and their co-operation with the United States government, and the nature of that co-operation that I think most Canadian citizens will find quite surprising, if not shocking, because it's all done in secret and Canadians are not aware of it," Greenwald told the CBC.